Last weekend I went on a night out with Fat Bob and Pugsley. But this wasn’t a night on the town with two old school friends. This was a night Bush-biking with my Surly fatbike and Bob Yak trailer. In this second post on Bush-biking, I’ll go over my kit in more detail and some of the lessons I’ve learned along the way. 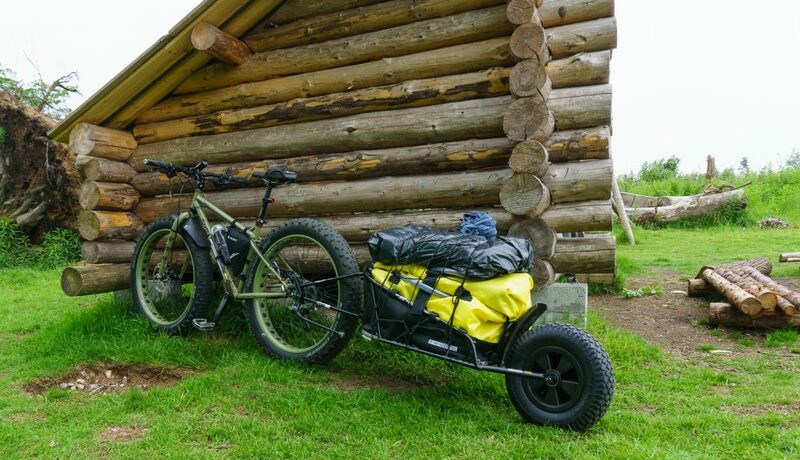 I mentioned in a previous post that my preference when bush-biking is to take my Bob trailer. I have a couple of reasons for this. The first is simplicity and speed. I have my Bob Yak Sack (the waterproof bag that supplied with the trailer) pre-packed with most of the things I take. It’s a case of throwing the bag in the trailer, hooking the trailer onto the bike and heading off. This beats hands-down strapping 5 or 6 bags onto the bike, especially when time is tight and the decision to go is a last minute one. The second is that I like my comforts. I like my inflatable air bed, my tent, and my cosy sleeping bag. 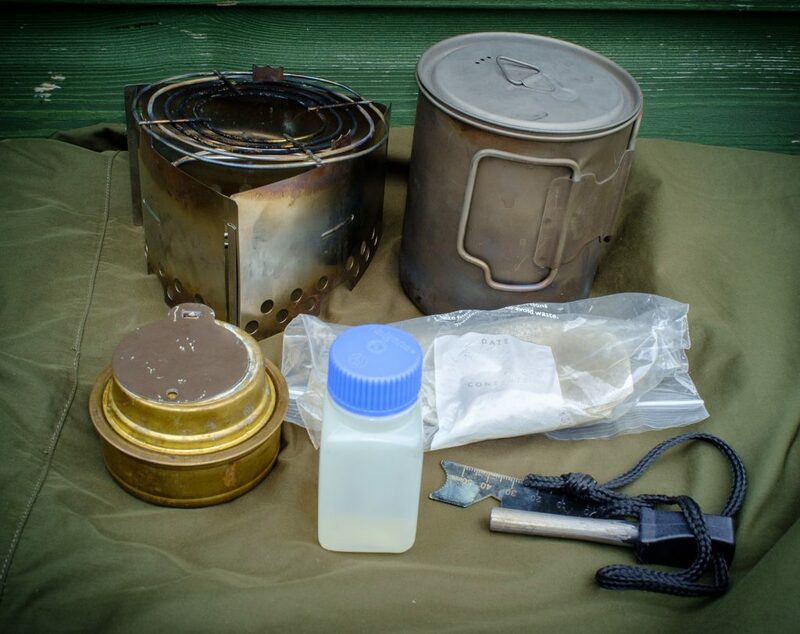 I also like my stoves and cooking gear, and I typically carry approx 4 – 5 litres of water for a 24 hour trip. I’ve yet find a camp spot near a good water supply. Water weighs a lot, one litre equates to one kilogramme. Bob is very adept at handling this type of loading, especially since I’ve done the Fat conversion. 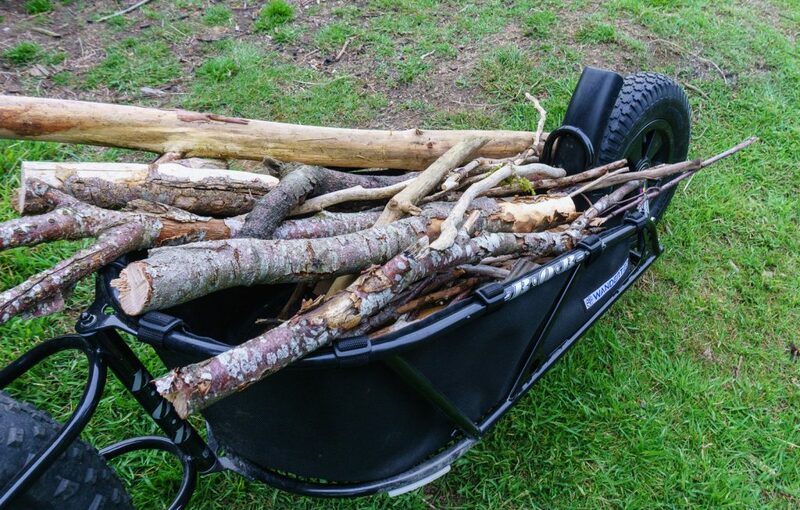 As an added benefit, it’s so much easier to collect firewood with a trailer. Thanks to Bruce Mathieson AKA Coastkid, for the inspiration and pointers. I organise my kit into a number of systems. I find it easier to customise for when and where I’ll be camping. The first system is shelter. 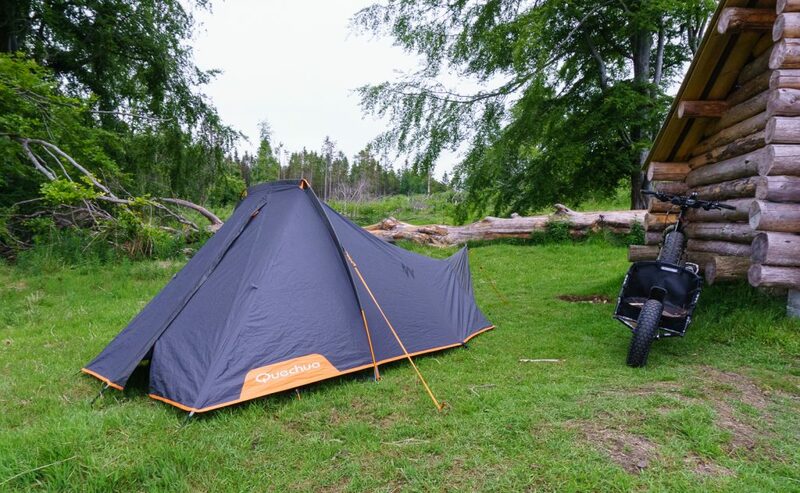 Usually, I take my two man tent, a Quechua T2 ultralight pro. It wasn’t expensive at around £70 new, weights 2kg and sets up in under 5 minutes. I’ll be trying a couple of lightweight tarps soon. For light inside the tent, I use a small led lantern which hangs from a clip attached to the inner roof. Next is my sleep system. Did I mention I like my comforts ? This is one of them. A sleep system needs to perform three main functions. Insulate you from losing heat to the ground, provide insulation from the cold air and provide comfort so you can get to sleep. It doesn’t matter how good a sleeping bag you have. If you’re not insulated from the ground you’re going to get cold, very cold. Ground insulation can be anything from a foil covered foam mat through to a self-inflating mattress. I have musculoskeletal problems from the surgeries I’ve had over the past 4 years and find it difficult to sleep on foam mats. As a result, I’ve invested in an Exped Downmat 7. This is a down-filled inflatable mattress. It’s super comfy, is rated to -24 C and has a built in pump. A Vango inflatable pillow Stowed inside an old pillow case along with my fleece jersey provides a reasonable substitute for my home pillow. Although I do sometimes take my orthopaedic pillow with me. Next in the sleep system is the sleeping bag itself. Here in North East Scotland, we usually need to go one rating higher than the sleeping bag manufacturer’s rating i.e instead of a 2 season bag, you need a 3 season etc. For summer / autumn use, I have an old Robins Downlite 500 and for late autumn and spring, I have a heavier duty Rab sleeping bag. 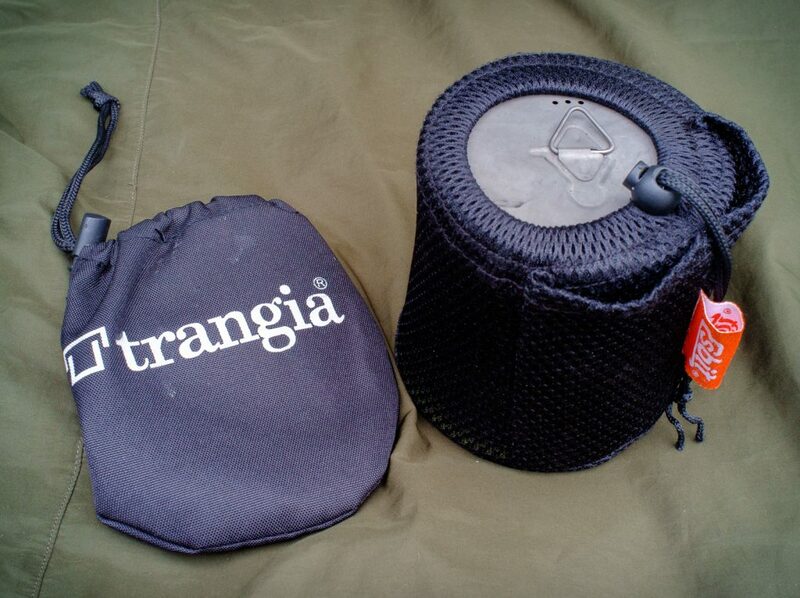 These, used in combination with a fleece sleeping bag liner, keep me warm in most weather conditions. On the rare occasions when we have warm weather, I use only the liner to sleep in. For added warmth I also take my merino wool base layers, top and bottom, unless the temperature is well over 15 degrees Celsius. These provide dry bedtime attire and double up as an extra layer of clothing for the cooler mornings. One of the main reasons people don’t warm up in their sleeping bags is they go to bed with the same clothes they’ve worn all day. Your clothes collect perspiration as you wear them, and if you use these in your sleeping bag it will make you sleep colder. One tip for keeping your sleeping bags it tip-top condition. 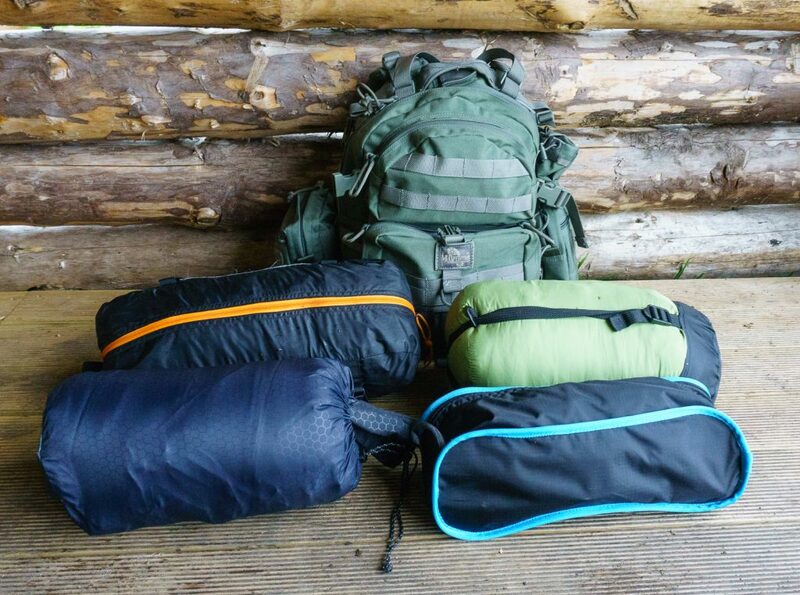 Only use the compression sack for transporting your sleeping bag to and from camp. At home store it in the storage bag that it came with. If you store your bag compressed, the fill will get damaged. It’s also a good idea to air your sleeping bag after every trip. Lastly, there are a couple of small but essential items that are part of my sleep system. These being an eye mask and a pair of ear plugs. As much as I like a beautiful sunrise with dawn chorus, during June and July this happens around 3am. And it never really gets dark at this latitude in summer. By using an eye mask and ear plugs I can get to sleep easier and stay asleep longer. The ear plugs also help if your fellow campers snore or when it’s raining heavily. The last system I’m going to share just now is my brew system. Whether you love coffee or tea, a brew is essential when camping. 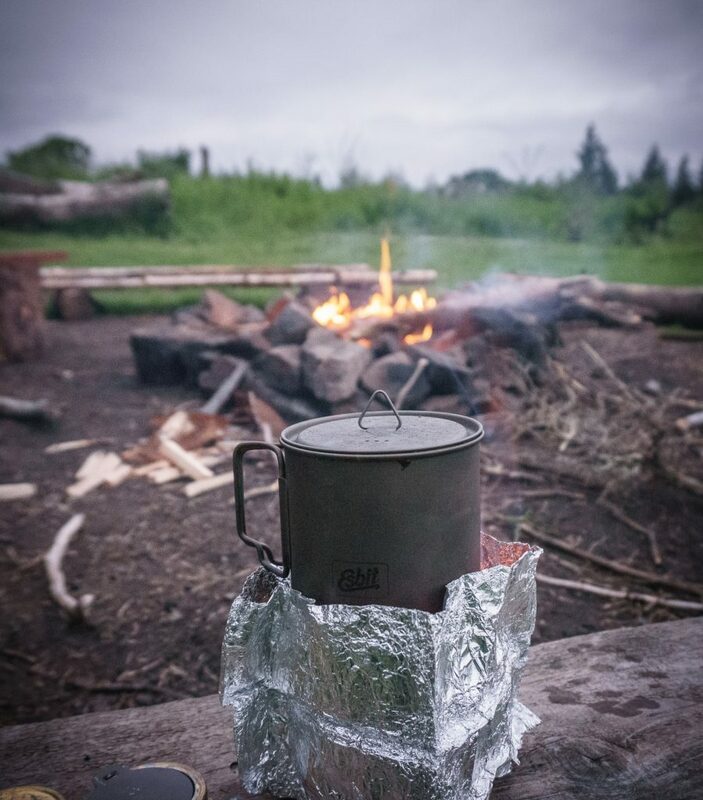 My lightweight setup is a Trangia burner, small nalgene bottle filled with bioethanol and a few tea bags stored inside my 750ml titanium cup. Along with a Trangia triangle, DIY tin-foil windshield and a DIY cup support made from a computer fan cover, I have the perfect brew setup. Just add water and a spark from my trusty fire steel. One thing I will emphasise. It’s not about having the best or most expensive kit. Use whatever gear you have at home, or make your own. A lot of my equipment I owned before getting into bushcraft. Most of it bought in sales or from online auction sites. On my first few trips I used an army surplus rucksack and a pair of old Karrimor panniers. I can’t think of a better time to get out and explore than at this time of year. So pack your bags and head out to the wilds. Enjoy being part of nature and have fun. and remember the jungle formula or the midgies and ticks will eat you alive..lol..
Looks like a nice setup! I have never been a fan of trailers, but I can see how yours works for you.